You can buy any type of filament from the market as long as the machine takes. 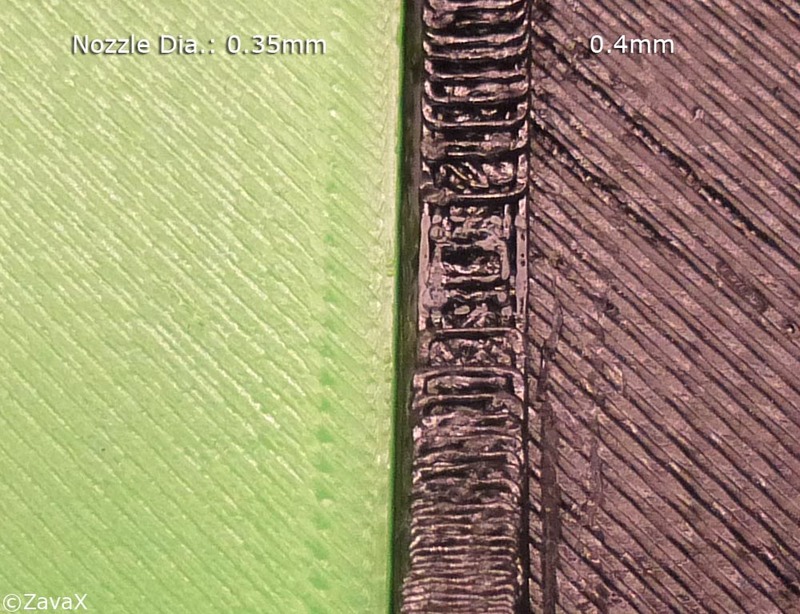 The nozzle diameter has nothing to do with the filament size. The most available type is the 1.75mm diameter filament, and that’s what I go with. Both ABS or PLA work with no regard to the nozzle size. The nozzle diameter won’t impact the mechanical design of the system. Most RepRap systems are installed with a X-Y-Z 3 degree-of-freedom linear moving module, on top of which mounts the heating nozzle to melt and extrude the material. If you can find a compatible replacement nozzle with different diameter, I believe you can simply swap it and the printer still works. Same software will work for different nozzle diameters. However, you do need to change some parameters to make it work properly. For example, since bigger diameter extrudes out thicker strings, you need to leave a bigger setting for each layer. This is easily understandable as bigger nozzle producing thicker strings reduces the number of layers you need to print. The nozzle travels less and saves time! This is an interesting phenomenon I discovered after using both of my printers. A nozzle with smaller diameter produce thinner strings which cools and solidifies really quick right after they left the nozzle, which is hot. As you know, the plastics becomes less sticky when it cools down. The filament extruded from a bigger nozzle, however, retains its temperature longer that is enough for the filament to settle on the build plate. This interesting effect is actually caused by the same reason above. This time it is not about sticking to the bed, but to the layer just print. Melton plastics sticks easily onto its lower layers even it is hanging out a little bit with some offsets. This, for sure, will help eliminate the supportive structure if the print itself can hold well. 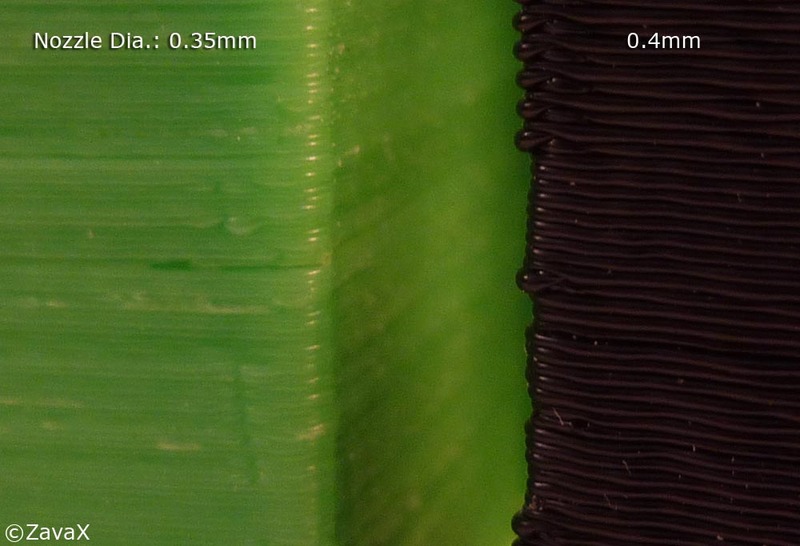 On the contrary, quickly solidified plastics from a smaller nozzle is less likely to achieve this, or at least, the amount of distance that a new layer can hang out is much more limited, in which case will require printing supportive structures. This is from the statistic point of view, the machine that finishes the job faster is sure to have less chance of failure, assuming both have same success/fail ratio. In general, RepRap type 3D printers don’t have really high reliability simply because of the way they are constructed: open-loop. The motor may slip a tooth if anything happens to be in the way, and open-loop control won’t be able to detect that. I believe the following picture will explain everything! When I drill a hole on the print, I feel more like drilling through a piece of tofu if it is printed with bigger nozzle diameter. And it is more flexible than smaller nozzle. I think this is cause by its inner netting structure. Smaller nozzle ends up more layers and causes the binding more stronger than the bigger nozzle, which has fewer layers. 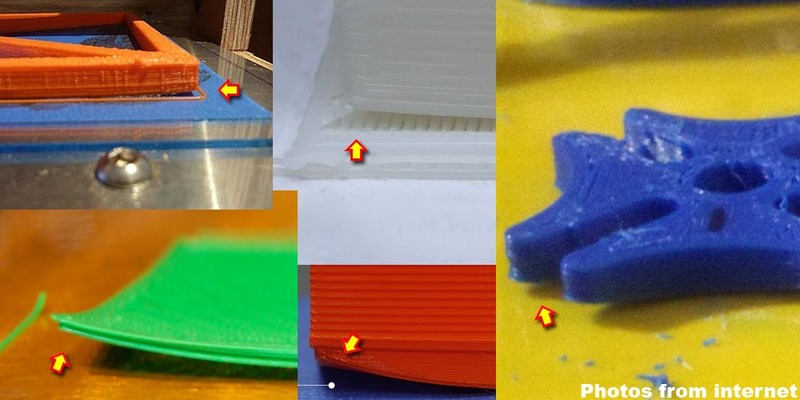 You should never rely on any of the RepRap type 3D printers for accurate prints. The system can control the nozzle position accurately, but has no control where the extruded filament should stay as soon as it leaves the nozzle, not to mention the plastics shrinks after it cools down. If I desperately need this part in a hurry, I use the bigger nozzle. If I care most for this smooth surface, I use the smaller nozzle. If I have to leave a job overnight, and don’t want to have a fail part on the next morning, I use the bigger nozzle. If I have many important and fine details on a part, I use the smaller nozzle. First of all, let’s check out how easy and sweet it is to remove the supportive raft from your 3D print. All you need to do is just to follow my instructions in the rest of this blog! The reason to print a supportive raft or base underneath your 3D model is obvious: the base absorbs any imperfections of your build plate; and if curling has to happen, it only affects the base, will not infect your model, so that your model bottom could retain flat. The raft, however, is not easy to come off if they are print in the same way as the real part. It is really a dilemma in which you hope your raft to be sticky enough to hold your model from corner-lifting, while at the same time, you don’t want your raft to stick too much to come off. Is it possible to achieve this if we use the same material printing with the same mechanism? The answer is yes, or at least, there is one product available on the market doing this just well — the UP! 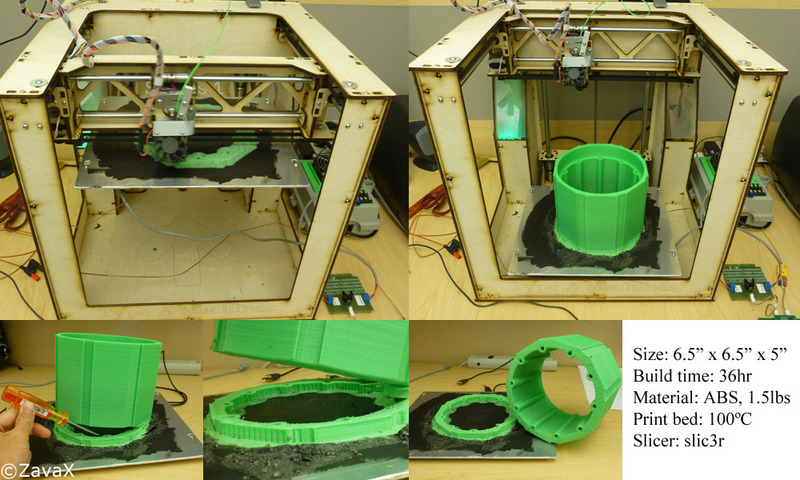 3D Printer, famous for printing peel-able supportive raft/base. 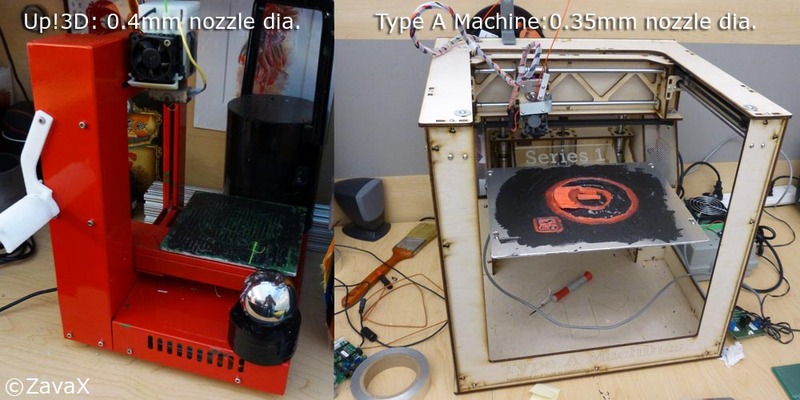 Unfortunately, the UP!3D is not part of the open source RepRap community, which means the algorithm behind their famous peel-able base remains mysterious. Taking a closer look at the UP! 3D printer, I didn’t find anything special about the hardware — Nozzle, 3 DOF axis, HBP — pretty much every basic element you would expect on a 3D printer. So the key stays in the software, the slicer. Since the latest version 0.9.9 of open-source slic3r included a new feature of “Raft“, I decided to give it a try to see if it reproduces the same peel-able raft on my Type A Machine Series 1. I believe if my algorithm works, you should also be able to do the same thing on any other printers. Figure 1. Visualization on Repetier-Host of print raft (left), without raft (middle), and real print from UP!3D with raft. This photo makes me really excited! 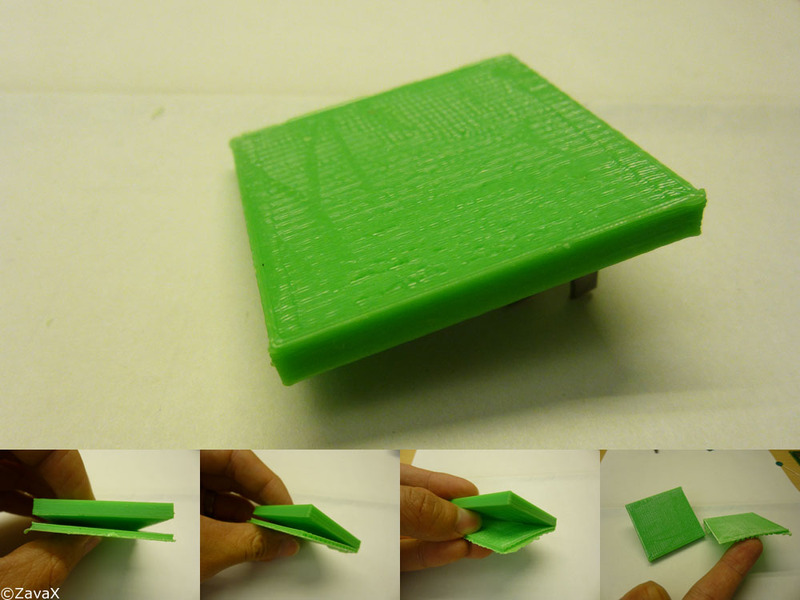 For the first time, the Slic3r is producing a similar raft to the UP!3D. My question is whether the raft could be peeled or removed easily. I went ahead printing this part and here is the result. Figure 2. A big piece of the raft remains on my print. It sticks very tightly to the bottom of my part and couldn’t be removed. So my conclusion for the new feature of 0.9.9 is NO, the raft is not peel-able. Let’s first take a look at the g-code generated by the new Slic3r to find out what exactly the “raft” is. I recommend using Repetier-Host to visualize the g-code as you can view your model layer by layer, which provides a very straightforward way of examining the output from Slic3r. I am slicing my test model, which is a 1.75″ x 1.75″ x 0.2″ plate, at 0.2mm layer height resolution with 49 extra raft layers. Here is what I saw from Repetier-Host (Used photoshop for better analysis). Figure 3. As you can see, there are 1 layer of brim and 49 layers of supportive raft print below the real part. 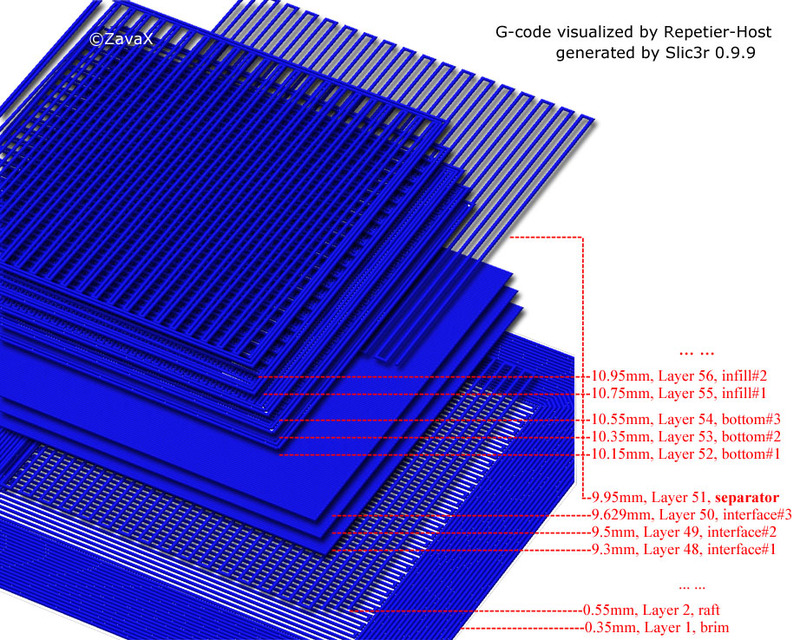 The top 3 layers of raft are set to print solid, also called “Interface layers” by Slic3r. The very top interface layer is only 0.129mm away from the the layer underneath, rather than 0.2mm. The interesting thing is the extra middle layer between the whole raft and the real part，marked as “separator layer” in the image. It is automatically generated by Slic3r, about 0.321mm away from the very top interface layer. It seems that Slic3r wants to make a very solid raft top by printing top 2 interface layers close together, and an easy peel-able upper part by printing the extra middle layer and everything on top of it a little bit far away. M109 S200    ; Sets target temperature and waits until temperature is reached. It takes the nozzle about 1 minute to cool down to 200°C and pretty much the same amount of time to rise back to 235°C. I observed a small amount of filament flows out of the nozzle during the waiting, and inserted some codes to raised the nozzle 2-3 inches above the print for the purpose of easy cleaning. Figure 4. The seam (left) between the model and raft has been increased to 0.4mm, wide enough to be visible in Repetier-Host. The line in cyan on the right is the nozzle travel. Here is the video of how the customized code is in action on my Type A Machine. And here are some results! Figure 5. 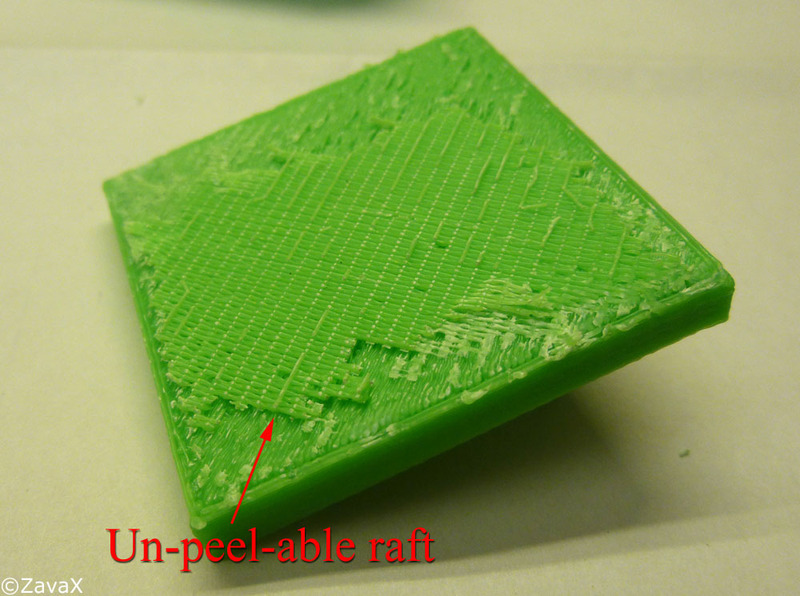 Now the 3D print raft is peel-able with improved Slic3r. Hope Slic3r will soon include this feature into their upcoming version! First of all, let’s see the video of the heated print bed in action! This table is built for Type A Machine 3D printer, but it should works for all other printers. I’ve been playing with my Type A Machine series 1 3D printer for a while. I like its volume – 9″ x 9″ x 9″, which is a lot bigger than most of its competitors on the market, and, of course, its affordable price. All magic, however, comes with a price. Its lacking of a heated print table makes my life really hard to print anything big with ABS. Comparing to my smaller UP!3D, Type A Machine usually ends up with very serious corner curling problems, which sometimes turns my print into a completely useless piece of part. This problem has been annoying me ever since I had it. You might not be familiar with this problem if you print with PLA filament, or you print small parts with ABS. Otherwise, curling and warping are becoming dominant issues for 3D printing. Unfortunately, many of my models are quite big (more than 100mm x 100mm). And PLA doesn’t work for me. Attaching a HBP seems to be an ultimate solution, but the manufacturer doesn’t seem to provide a HBP for this model anytime soon. I decided to make one on my own. Figure 1. Example prints from Internet with problems of corner lifting, curling or warping. 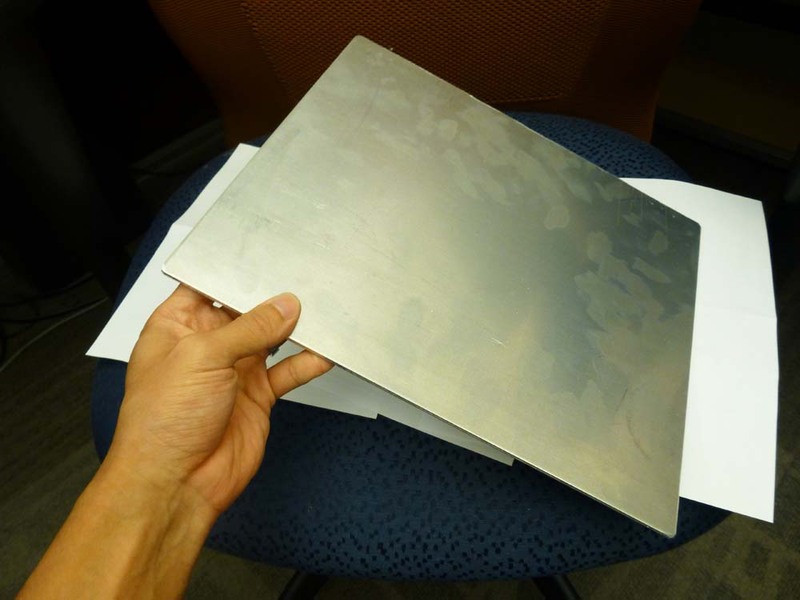 I am using 1/8″ thick aluminum sheet as my table material since I am lucky enough to have access to a CNC machine. The table dimension is all you need to know before milling the sheet into a build plate. The company, however, is releasing the drawings for anything else except for the table. I ended up measuring everything with my caliper. The overall size for the table is about 260mm x 310mm. The big screw hole is 0.31″ in diameter, and the small one is 0.158″. 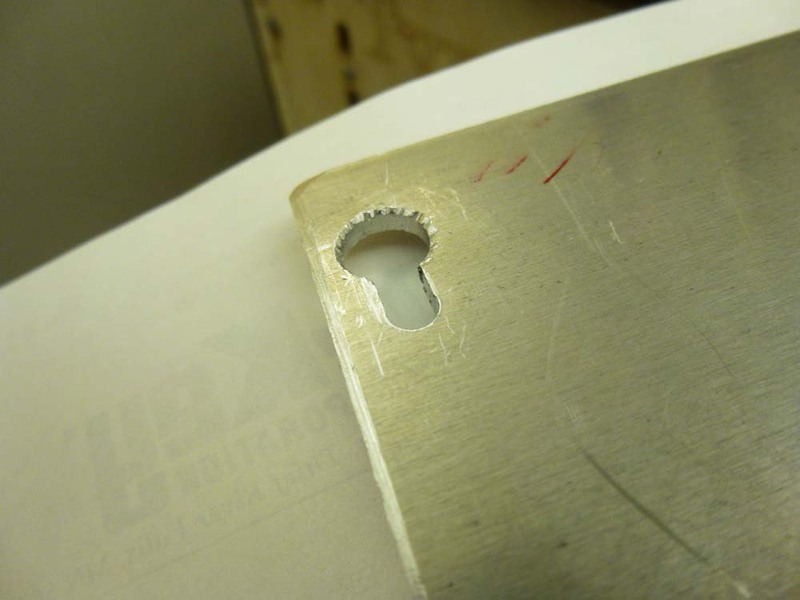 The center of these two holes are about 0.415″ apart to make a long slot. There are four of those slots sitting on the corns of a 6.05″ x 11.07″ rectangle. All the measurements don’t need to be crazily accurate, and they work just fine for me. Figure 2. The aluminum sheet is prepared for CNC mill. Figure 3. Not a CNC expert, the hole was milled quite ugly. Countersink-ed the edge a little bit to make it “smoother”. I talked about temperature control circuit using micro-controller, thermocouple and power relay in my last post about “hacking a toaster oven into SMT reflow oven“. To control the temperature of the print table, it is basically the same thing. I am going to using the same circuit except for the heating source and switch, for which I choose metal clad resistor (TE 10ohm, 16W, screw mount) and N-channel power MOSFET (Fairchild FQPF33N10L). 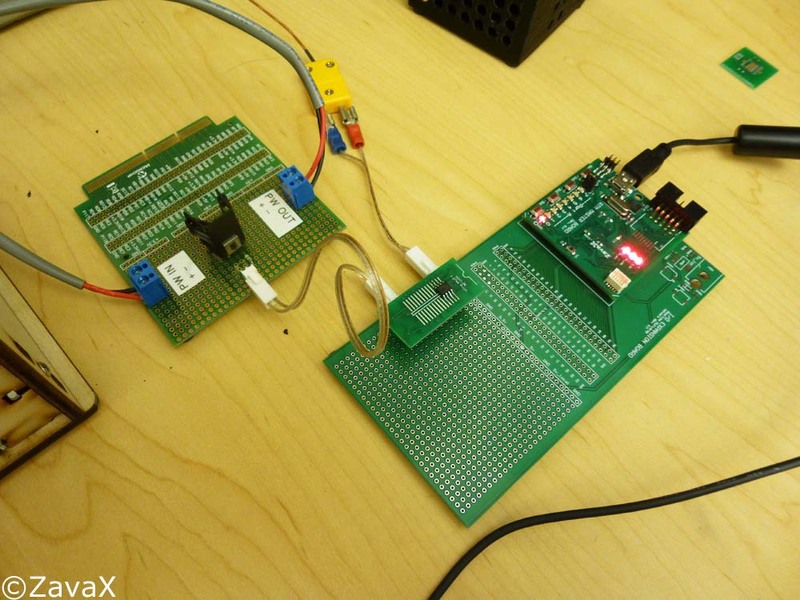 This power MOSFET has a low gate threshold voltage (2V), so the micro-controller can directly control it. Figure 4. 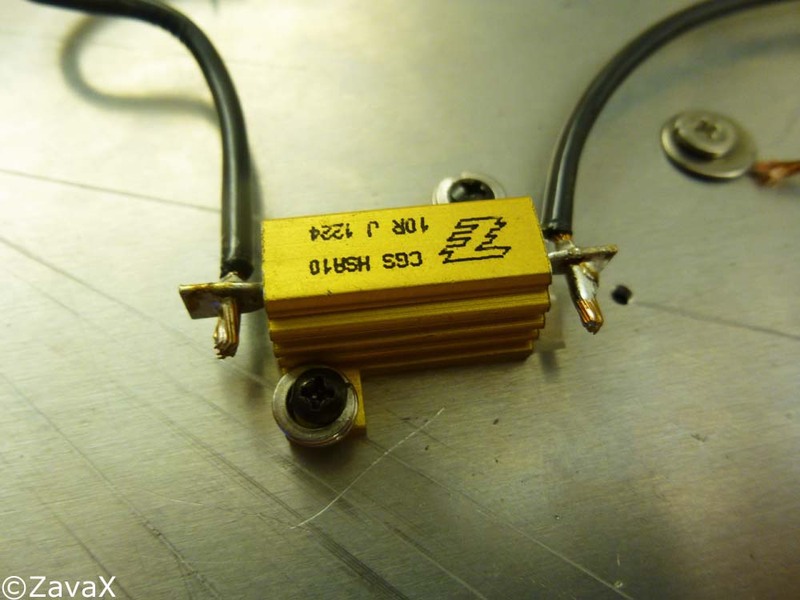 The resistor is mounted on the back of the aluminum sheet with screws. I recommend using thermal-conductive tape for better heat transfering. Figure 5. 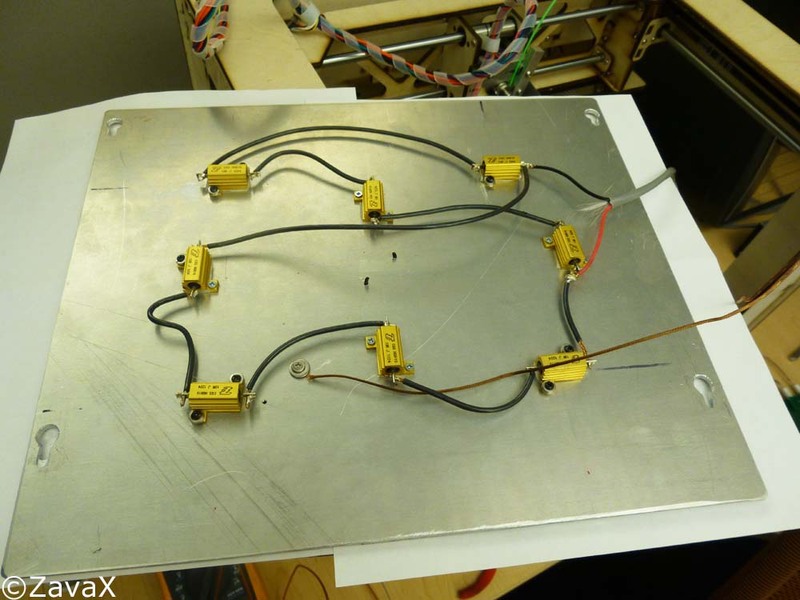 Eight resistors are all mounted and wired in a pattern of 2 parallel groups of 4 series. I am choosing this pattern for the least amount of wiring. Four 10ohm/16W resistors in series will require 48V to obtain the best performance. Each resistor consumes 1.2A current, roughly 14.4W of power. So a 48V AC DC power supply with load capacity of at least 2.4A is a must. The actual test show that the heated build platform can heat up to over 100°C in room temperate with power consumption at about 150W. The thin cable in brown color is the thermocouple, which senses the temperature back to the micro0-controller. Figure 6. The N-Channel MOSFET is wired to the micro-controller. I suggest using a 100ohm in series between the MOSFET gate and micro-controller output, especially in this case where a big current needs to be switched on/off. The rest of the wiring is pretty simple. Since the N MOSFET is a low-side switch, +48V from power supply goes directly to the load, the other side of the load connects to the drain of MOSFET, and source goes to ground. Figure 7. Finally, here is the photo of a new print finished on the HBP! The corners are completely stuck to the plate flat! Figure 8. The biggest part I’ve ever print! It took quite long, about one day and half, but turned out to be a big success. The heated print bed really helped keep the bottom flat. As you can see, the supportive raft is peel-able now. I will talk about the tricks to 3D print peel-able base next time.